After the railways were nationalised under British Railways a “Modernisation Plan” was introduced. This started a rapid process to replace less efficient wagons in the home iron ore industry with simple, robust low tare weight “tipplers” capable of working from the quarry face to steelworks where the wagons were physically tipped over to discharge their contents. 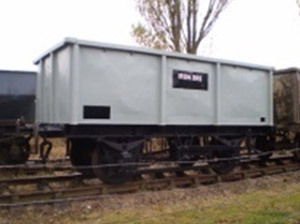 In all 9,590 wagons were built between 1951 and 1960 and very quickly becoming the ubiquitous wagon in the east midlands ore fields. Our operational rakes represent the last phase of railway wagon operation from the mid-1950’s until the quarry closures of the 1970’s. Although similar, keen students will spot minor build differences between the wagons. 27-ton unfitted, built for Stewarts & Lloyds Ltd in 1962 to BR design.